ALSO: Just need some aluminum for a vertical antenna or light weight mast? Then check out our new “Vertical Antenna Kit"
Other non-ham uses include beach fishing rod holders, heavy duty tent/canopy poles, small sailboat mast/boom, outdoor netting/lighting poles, flag pole, workbench/table legs, fence posts, etc. 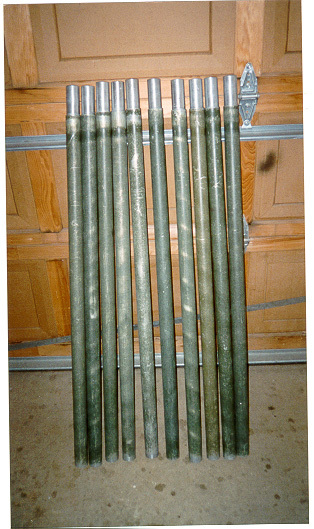 Military surplus aluminum masting tubes. Each tube is 48 inches long by 1.785 inch outside diameter (inside diameter 1.57 inch), wall - 0.11 inch, and weigh 2.7 lbs each. The last 3.25 inches is a smaller diameter (1.55 inch OD, 1.33 inch ID) that then fits into the next mast section. This 1.55 inch diameter piece is 6 inches long and is used as an inner sleeve that forms a strong joint. The outer tube has been slightly crimped all the way around at two points to firmly hold the 6 inch piece in place (see close-up picture below). The tubes originally came with a heavy coat of dark green paint. They now have some evidence of rub marks, scratches, nicks, and a few minor dents (see picture above and example: tubes-1) due to bouncing around inside those military vehicles. The pieces slide together easily with close tolerances. This is high-grade aluminum, not the softer type used in some amateur antenna elements and booms. Ten (10) of these stacked together forms a vertical mast of 37 feet. With a pivoting base assembly (see Accessories) and proper guying, one person can raise 37 feet easily. With more help and additional guying, greater heights are possible. An instruction/information manual is provided with each box of 10 sections on how to install a 37 ft. mast. With a Radio Shack 3 foot roof tripod (#15-517), a small VHF/UHF/WLAN vertical or yagi can be raised 16 to 24 feet without guying - just right for getting above the roof line from the outside deck/patio. For permanent installations, the tube sections can be easily locked together by drilling and inserting several machine screws per joint. Or, for temporary installations, 1/4 inch diameter bolt/washer/nut hardware can be used to hold everything together, then easily disassembled and packed-away. The screws/bolts also help to make the complete mast assembly more rigid. Be sure to check out our slightly lighter-duty Vertical Antenna Kit, which can also be used as a mast system. We are unable to specify a yield or tensile strength due to the cost of testing. Plus, then we would have to ask a whole lot more to recover our costs. As an experiment, we were unable to bend a section over the extended part of the van's trailer hitch with one end on the concrete driveway and pulling as hard as we could on the other. So, it's stiff and strong! Not sure what these cost the government, but consider these a return on some of your taxes! We finally developed a method to make custom guy rings for these mast sections. They are available in strong 1/8-inch-thick high-quality 6061-T6 ALUMINUM, which we then paint to match the mast sections, see pictures on Accessories page. These new aluminum guy rings are laser-cut to our specifications and fit nicer than our former steel versions. Priced at $7.00 each, or 3 for $20.00. If you are using the full 10 section height of 37 ft. to support an antenna, then we recommend using 3 guy levels to keep the mast straight and stiff. And, to protect the guy line from the sharp metal edge of the guy ring attachment holes, we offer 3/16 inch diameter quick-links, rated for 660 lbs, for attaching your guy line, at $1.25 each. You’ll need one quick-link per guy line. See the Accessories page for more info. 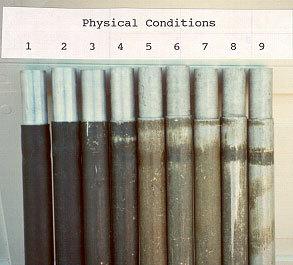 The condition of the mast tubes vary from brand-new to heavily used but serviceable (see physical condition photo to the right). The current August 2017 stock is mostly condition 1-3, with some in condition 4-6. We remove any serious nicks or burrs that prevent proper assembly, and verify that the pieces will actually go together. All you need to do to make these look new again is obtain, from your nearest hardware store, a can of spray paint, such as, Krylon Camouflage Paint System. Shipment is normally via FedEx Ground from Zip Code 27615. A box of ten (10) tubes weighs 30 lbs. Add 1 lb per guy ring/4 quick-links. We use glue on the box end flaps and the strongest tape available (Scotch 8959-RD "Extreme Application") to keep the package intact until it arrives at your destination. To continue bringing you these outstanding surplus aluminum sections, we now have to compete directly with others who recognize the value of the high quality aluminum available in these items. We try to maintain a decent supply of pieces in stock; however, we are not sure how much longer these will be readily available. Prices vary (from $9.00 to $12.00 each) due to the condition of the tube sections and the erratic availability of these through surplus outlets. Since our standard shipping boxes are suitable for quantities of 4 or 10, please keep that in mind when requesting quotes. Buyer pays all shipping costs. Contact us for price quote based on current stock (include your Zip Code). Money Orders, Bank Cashiers Checks, or PayPal are the ONLY payment method accepted. Sorry, NO direct Credit Card transactions. Note that you can use a credit card through PayPal. Additional questions may be answered via e-mail. Please, do not send payment until you have received correspondence relative to stock, total price, and payment details.